As you know Saturate! Records from Hamburg is one of my favorite labels for bass / nu beat electronic music. They support young and brave artists and do not hesitate to release more experimental and weird stuff. There is just one requirement - QUALITY. 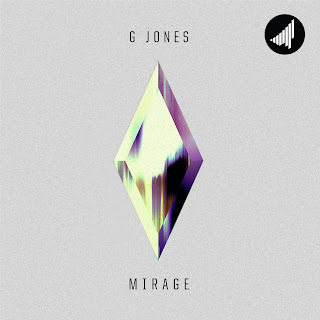 The new EP "Mirage" by G Jones is another masterpiece from Saturate!. Which might even convince me to approach trap music with a bit warmer attitude. Maybe due to the fact that G Jones, hailing from Santa Cruz in California is a hell of the producer creatively carving out his own style within pretty formulaic genres. Anyway, good music is still good music, whatever you call it. G Jones creates a fascinating patchwork of trap meets juke soundscape with some hints of glich hop or trillwave, full of crazy bleeps, beeps and whatnot in the background. I love such "controlled" cacaphony in electronic music and G Jones delivers his with absolute mastery. Of course he does not forget about the Beat & the Bass. Just listen to "N Judah" and "Mirage" - these tunes will fuucking storm the dancefloors across the world. Or "Alias", strongly reminding me of the Eprom's anthem "Regis Chillbin". While "Pyra" and "Drift" including great synths and distorted basslines, typical for glitch hop tunes, show a real versatility of G Jones' skills. The best trap tune on this EP - "Smoke Rings" (again built on jukeish drums) has the beatifully distorted, talking bass and lovely synths. Definitely, one of the best and freshest releases this year. Don't sleep on this. Grab this EP on pay-what-you-want basis. The package also includes several great remixes, with "Alias" remixes by Subp Yao and Boeboe and "N Judah" refix by Trapmaster being my favorite ones.